Red Tide South is a two-player game. 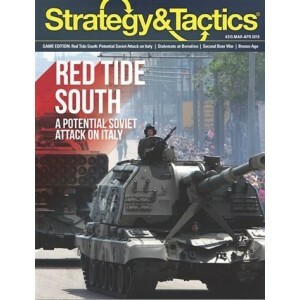 It is a stand-alone game that can is also designed to be played with Red Tide West (Modern War #15). A war in Europe during the 1980’s was primarily going to be decided, one way or the other, in West Germany. Other fronts and theaters were therefore almost irrelevant in the short term. Considering the Soviets’ exceedingly optimistic timetables by which they intended to overrun West Germany, events elsewhere would have not even played out before the war ended (either by mutual annihilation or by rapprochement). However, the Balkan Front could have had the most direct influence on the campaign in West Germany. If there was no significant nuclear exchange in Central Europe, a Soviet capture of the heavily industrialized Po Valley would potentially compel the Italians to sue for peace, as well as serve as a gateway to Southern France. Each hex is equivalent to about 10 miles (16 kilometers) from side to opposite side, and each turn represents about a day.